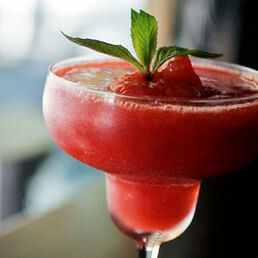 If a cool refreshing beverage is what you’re looking for then the Strawberry Daquiri may just be it. With or without alcohol, the strawberry daiquiri is a tasty treat that requires only a few ingredients and is easy to prepare. The following recipe makes eight servings and is good to serve as light refreshment when entertaining. It needs six cups of ice, ½ cup of white sugar, four ounces of frozen strawberries, 1/8 cup of lime juice, ½ cup of lemon juice, ¾ cups of white rum, and ¼ cup of lemon-lime flavoured carbonated beverage. Combine the ice, sugar, and strawberries in a blender or shaker. Add the lime juice, lemon juice, rum, and lemon-lime carbonated beverage and blend until mixture is smooth. This daiquiri can be made with a number of variations. Fresh strawberries can be substituted with strawberry-flavoured syrup. You can also make the mixture without rum for a virgin daiquiri. The daiquiri can also be blended with a pina colada to make a Lava Flow. To add the pina colada use 3 ounces of coconut cream, 6 ounces of pineapple juice, and 1½ ounces of white rum; blender or shaker with crushed ice. Blend or shake very well until smooth.